Netherlands and New Zealand A all-rounder Logan Van Beek has been signed by Derbyshire as an overseas player for the 2019 season. 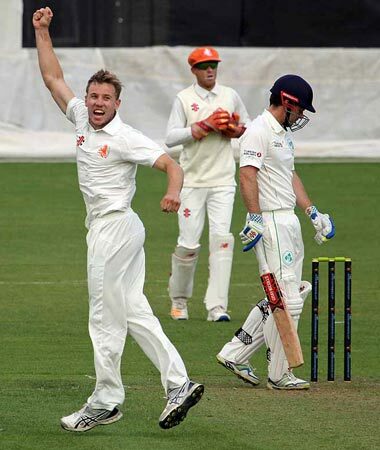 Van Beek has appeared for the Netherlands in Twenty20 international cricket, including at the 2014 T20 World Cup during which he claimed best figures of 3-9 in the win against England. He also featured in the 2016 edition of the competition and his last appearance in Dutch colours came in the InterContinental Cup game against Ireland in Dublin in 2017. He has played 39 first-class matches and claimed 109 wickets at an average of 30.33 and best figures of 6-46. Van Beek has also scored 1,087 first-class runs and one century. He has also taken 61 List A wickets, with best figures of 6-18 for Netherlands against the UAE, and an average of 30.04 and an economy of 5.54. In total, van Beek has taken 217 wickets and scored 1,675 runs in 151 matches. Head of Cricket, Dave Houghton told the Derbyshire CC website : “We were looking for a specific type of cricketer and someone to enhance our bowling attack. “Logan came highly recommended by our contacts in New Zealand, including John Wright. He gets his wickets with balls that are pitched up and that’s a good length in England, especially in the early season. Van Beek added: “I’m really looking forward to joining Derbyshire next season. I’ve followed the county competition for a number of years now and to have the opportunity to play for Derbyshire is really exciting.